It was one busy week. So busy in fact that it took us a week to recover and report back. We've taken a selection of pictures from it, so you can take a look for yourselves. Over Saturday and Sunday the 5th and the 6th December we had the most jam-packed Winter Sale ever, and sold over 1000 pots. 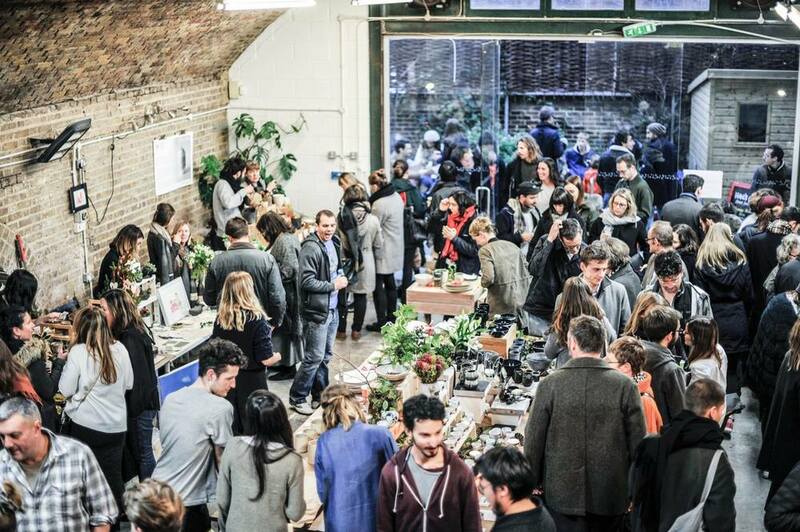 The proceeds all go to support early-career ceramicists in establishing their businesses. In addition, we raised over £1700 for medical emergency supplies for one of our students, nurse Hannah Goodwin, to take to Calais to help refugees set up a medical centre. We were also part of Hey Clay, the initiative by the Craft Council and the BBC's Get Creative to get more people getting their hands in clay. We ran free taster sessions with our resident artist Ben Sutton throughout Friday the 4th. Tallie spent Friday 4th at the Treasury meeting George Osborne, the Chancellor of the Exchequer, and other small business owners, as Turning Earth has been chosen as one of the Small Business 100 - a group of businesses that represent the diversity and innovation in the sector. She learned that small business makes up 60% of the UK private economy. This means that a well-organised small business and co-work movement should be able to influence policy to support more sustainable, decentralised industry, which is what Turning Earth is all about. Together, small businesses dwarf the multinational corporations that the likes of Osborne meet every day and we hope to see them gaining more influence. Organising under the banner of Small Business Saturday seems like a good first step. For now, we will wish you a Happy Christmas, take a breather, and come back refreshed in the New Year. Our next studio sale will be held on Easter Saturday, 26th March 2016. We have never seen so many people at one of our sales! Click through the images to see more pictures of the event. Coil pot by one of the Hey Clay students. Hey Clay for the Crafts Council and BBC Get Creative. On Friday the 4th December we ran a couple of free coiling workshops with Ben Sutton to give new students the chance to get their hands in clay. Turning Earth founder, Tallie (second from right), with Michelle Ovens MBE and other members of the Small Business 100 at the Small Business Saturday Fair at the Treasury on Friday 4th December 2015. A silly selfie with George Osborne to a) prove it happened and b) because one of the other small business owners shouted "what about the girls?" as he was being ushered away, so the Chancellor was forced to stop in his tracks. Hopefully the voice of small business can be as effective at influencing the government on bigger issues. Tallie with Michelle Ovens MBE, the pioneer behind Small Business Saturday UK. So it went out with a bang, or more accurately, like a polite British farewell after a village summer fete. There was something very reassuring and reasonable about the final episode of The Great Pottery Throw Down. Arguably, the best man won; no fireworks, no lap of glory no more tears even. Just no cracks in the handles or bottoms. It was the last montage of where they are now which was most relevant to us in the end, as the life changing (sort of) drama unfolded from week to week, we saw how it shaped and changed the contestants, how they improved and developed and then we were given the snippets of the impact it had had on them after it was over. Somehow that last part brought something home to us too. How we had changed as a collective, as a studio. It wasn’t so much the excitement from copying the challenges or learning new things. But how we’d grown physically and inexorably, the studio membership and interest in it has soared and peaked as the show progressed, generating a growing waiting list. We’ve had to find creative ways to accommodate and schedule courses without starting riots. It’s not bragging, it’s the nation waking up to possibilities and Turning Earth, currently, is right in the frontline: BBC’s Throwdown it seems, has changed our lives too. New pressures on established systems due to maximum capacity membership have forced us to adapt to new ways of running a studio. It used to be an irritation when a kiln mis-fired, now it’s an emergency. We’ve had to arrange extra shelving, a new kiln, more wheels, more hands on deck. That frantic energy to win challenges in the show has segued its way into our work life. The difference is, we don’t get to switch off. So, well-potted Matthew, a close tie with Tom perhaps but quality shone through. We’ve enjoyed the ride, learned a few things here and there. We’re just wondering how soon it will be till you’re on our screens again, and what the hell will become of us when you are. Another serious episode of the Throw Down, more crying and sweating (no blood thank goodness) and happily, a slight reduction in sexual innuendo. Someone had to go of course, and Sandra, we salute you too, a bit of a gamble using Tellytubbies as inspiration for garden sculpture, but I liked it. Not quite sure how Matthew managed to win however, maybe my finger is slightly off the pulse of contemporary aesthetics, but hell’s bells, I guess that’s the beauty of modern creative freedom. I’m so happy that the Throw Down is bringing pottery back into the public consciousness, or is it that it was already reemerging and so they felt the need to make the show about it? Either way, the only problem is that it is also comes with a vaguely pernicious sense of urgency and an anxious threat of failure. And I’m not sure that’s how you should exist in any situation, especially when swimming in the juices of your own creative daemon, you’ll end up sinking, or even doggy paddling. And it’s starting to creep in here, at our studio too. Because of the show - or the zeitgeist - we are now at capacity with a growing waiting list; it’s hard to get on our courses (I get angry calls from people who’ve failed multiple times to sign up) although we run as many classes as we possibly can. It brings that same nervousness and frustration. It was never meant to be like that. We need calm here, and temperance. Tessa agrees with me. ‘make three pieces’, she says ‘take all the time in the world, make them in a way you can enjoy making them, put some You in them. Don’t be furiously churning out fifty for a sale or a show or a judge; they’ll have no real value in them’. What wisdom! Anyway, gripe over; next week it’s porcelain. Are they in for a treat?! What a challenge that can be at the best of times, our porcelain master and member Tom Kemp manages to make it look like a doddle as he calmly throws perfect 3-foot vases out of the stuff, but it isn’t, I know. It still gives me the runaround as it spins around, making itself into white mound of nothing again and again in my hands- and I’ve even done a Jo Davies masterclass. Good luck team. Don’t sweat it. So we’re feeling for the contestants who remain on BBC2s The Great Pottery Throw Down. Judgment came and another brave soul is gone. Oh no! Nigel come back, we loved your work! What does a crack matter in a basin anyway? I know I’ve been tempted, break something in the bisque firing: fix it with a bit of glaze in the second firing- if you have a BBC show to stay on, what the hell. Episode two gave us all a reminder of why we don’t attempt to make coiled sinks and bathroom ware every day. But now we will, we have to, we’re redoing the bathroom in the studio and have been inspired, again. So, a new project is born for one of our members: Make us a sink as beautiful as Matthew’s swirling green Aztec temple was, and it’s going in. Watch this space folks, I’ll post a picture of the winner. I knew it would happen. Throwing blindfolded, what a torture. Please Tessa don’t make us do that one too. Good for TV viewing maybe, but I think we’ll skip that one here, not enough blindfolds anyway. What did almost slip past in a twinkling, was the vague nod to clay shrinkage rates which is always a real issue for sink makers and tile makers and in fact anything that requires exact measurements after artesanal work is fired. I was amazed at how many of them managed to slot that copper plug unit into the hole with precision first time of asking. High fives guys. So, the competition in our own studio has taken place and the pieces inspired by the first episode have been put into the kiln -things here don’t tick over quite as fast they seem to on the telly- and we’re keen to see who’s won the first round; apparently the bowls do have to stack. Good luck guys! Looking forward to next week’s episode, was that a raku kiln? Can’t wait for that one. Luckily we haven’t got one of those terrifying open-air, where’s-me-eyebrows fire pits yet or lord knows what Ms Barrett could be plotting for us. Also a daily smoke out of the whole of Hackney probably wouldn’t go down at all well with our neighbours. 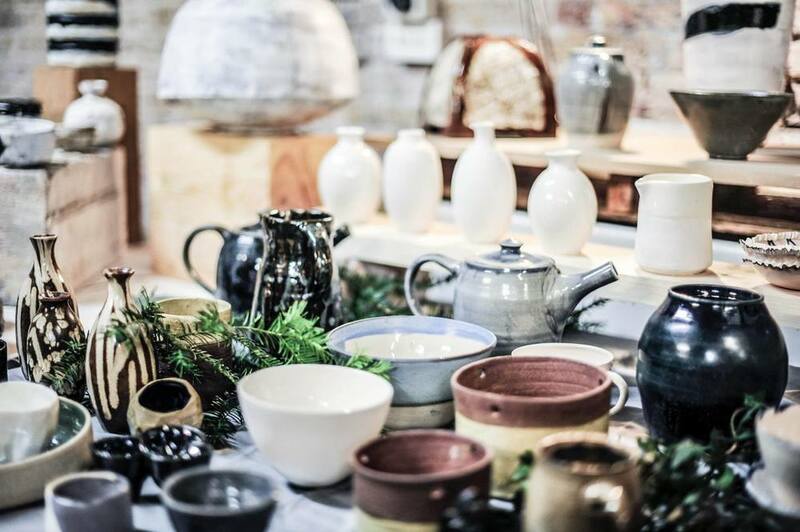 As much as we try to hide the fact that we’re all very excited that The Great Pottery Throw Down is now on our screens, it’s impossible to keep our curiosity in check and our focus away from the exploits of the 12 potters that are now going to be put to task every Tuesday night. There’s great interest here at Turning Earth and secretly we’re all fired up, itching to see if our own pottery skills match up to what is being created on the show each week. Everyone here knows exactly how daunting it is to get clay to do exactly what you want it to do, let alone under the eye of a judge; on a tight schedule, and to throw five – yes five – stacking bowls in 2.5 hours! I know that a lot of people here would have relished the chance, but still, it’s lucky that at our studio we have more collaboration than competition. As one of our members, Lydia, noted on our members page on Facebook – “20 handles in five hours. Go!” – the added pressure is a bit much, and thankfully, a normal potter wouldn’t be subject to it… unless of course she’d failed to negotiate the deadlines of those commissions properly. We have all been inspired by the activities outlined in the first episode. In fact, even though not much ‘throwing off the hump’ takes place at our studio, I’ve definitely overheard comments recently about the need to get hands on humps again (although I don’t think anyone has actually had a request for 20 egg cups to be produced in a mere heartbeat). But Tessa Barrett, our very own teacher and one of our most experienced potters, has buckled under the temptation the show presents, and will be challenging some of our members to reproduce some of the tasks given to the TV contestants every week. It’s just too tempting I guess, and she’ll even be competing herself – watch out folks, she’s a fiery virtuoso on the wheel – and the challenge this week will be to make three cups with handles and five bowls. Mercifully, they don’t have to stack. Thanks for that Tessa! So, naturally we’ll be eagerly looking forward to the rest of the series. Paying attention to all the little tips and ideas that can be pinched, pilfered and put to good use, whilst absorbing all the science extras. Trying not to get too involved as people inevitably get voted-off despite being fiercely talented, or when an unwelcome crack appears in a rim or a base or the glaze slips or the slip runs, as such things are bound to do from time to time. Even if you are Britain’s best.